What can you say about a highly esteemed, exceptionally insightful, legally blind sportswriter? They don’t make ’em lie that any more. Hal McCoy expected to cover the Cincinnati Reds for the Dayton Daily News until he was called off to the Big Press Box in the Sky. But a lousy economy and a flagging newspaper industry benched him before his final inning. What can you say about a highly esteemed, exceptionally insightful, legally blind sportswriter? They don’t make ’em like that any more. This was not the way one should meet Hal McCoy. He was not in his natural environs, up in the press box watching Pete Rose in his explosive batting crouch or Johnny Bench climb the wall behind the backstop or writing about the time Eric Davis robbed Jack Clark of two home runs over two consecutive nights. Nor was he in the locker room, sitting down with Tony Perez or Barry Larkin or Brandon Phillips before deadline. All of that was over. Gone for good. Fini. 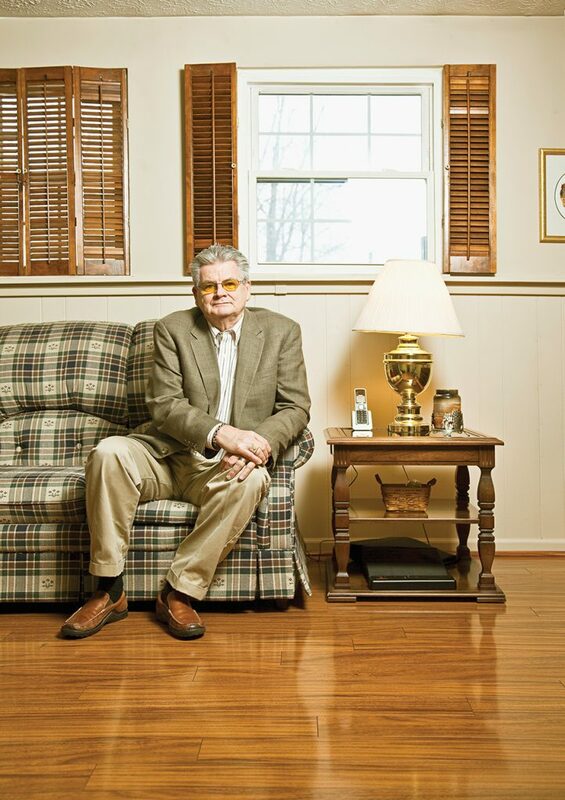 Now the imposing figure with stiff gray hair and yellow-tinted glasses stood, his hands in his jean pockets, watching his wife Nadine answer a question from a reporter visiting their suburban Dayton home. “Am I still mad?” Nadine said, when asked about the circumstances of her husband’s exit from the Dayton Daily News months before. It was late December, 2009—the time of year when Hal, by his own admission, is a bear to live with—puttering around the house, waiting for the day pitchers and catchers report to spring training and he can return to his other true love. For 37 years, Hal McCoy covered the Reds like no beat writer of his age, writing with wit and grace and humor about the oldest franchise in the game. By the time of his quasi-forced retirement last year, he’d already ascended the throne as another “dean” of American baseball writers; had won the J.G. Taylor Spink Award for “meritorious contributions to the field of baseball writing” from the Baseball Writers’ Association of America; and had served two generations of Reds fans—particularly in the city of Dayton and the northernmost reaches of Redsland—as the authoritative voice on the team. More important, perhaps, was that since 1973 McCoy had been a part of something greater—part of the confluence of beat writers from Cincinnati and Dayton, along with visiting reporters from Columbus and Lexington and Louisville, who helped promote and maintain the Reds as a multi-state team, stretching across the region from Indiana to West Virginia and beyond. Now, along with the end of newspapers as we once knew them, it seemed McCoy was taking that era with him. McCoy’s departure from the paper is certainly one of those stories—of a beloved newspaper man informed late in the game that he was too expensive to hold onto, that there was a welcome benefit and buyout package waiting for him should he decide to leave. But McCoy was the News, was Dayton, was the Reds, and had always been led to believe that he could cover the team as long as he wished—even after he went legally blind in 2003. That presumption came to an end last August. The team was in San Francisco, and McCoy, who had made nearly every road trip in his nearly four decades covering the Reds, had been grounded from this one for budgetary reasons. From all over the newsroom, News editor Kevin Riley had been calling in people eligible for a “retirement incentive offer,” telling them what the next year would look like should they decide to stay. According to Hal, when he and Nadine entered Riley’s office—his wife has driven him nearly everywhere (except the ballpark) since he lost his eyesight—the editor told him he was welcome to stay at the paper, but that as of the 2010 season the News would no longer devote staff resources to cover the Reds. “You mean on the road?” McCoy remembers asking. “Not at all,” Riley replied. Hal and Nadine sat in Riley’s office stunned and silent for a few minutes. The Reds had been the main thrust of Hal’s adult life. He had covered the Big Red Machine in its glory and its demise-by-ownership. He’d led the paper’s investigation into Pete Rose’s betting on baseball and chronicled the star-crossed era of Ken Griffey Jr. There was no way he could stay on full-time without the team. The rhythm of his days—from spring training to the cold, last games of fall—would be broken. What would be the point in hanging on? In this new landscape…. Well, you have to feel for the guy. Here was the editor of a well-respected regional paper being forced to put one of his star reporters out to pasture in a last-ditch effort to help the paper itself survive. It is a sad and profoundly unenviable situation—for newspaper staffs, of course, but even more so for the cities, towns, and communities they serve—and one that editors around the country increasingly find themselves in by the day. But back in December, sitting in Riley’s office, it was worse for McCoy. All those years spent building a reputation as the best Reds beat writer in a four-state region and one of the elder lions of the baseball writers’ dwindling herd, and this is the thanks he gets? McCoy wanted to break the news first, of course. Shortly after leaving his meeting with Riley—without giving him an answer—McCoy announced his departure to readers via his blog, “The Real McCoy.” He told readers that he understood. The roughly $175,000 it took to cover the Reds each year was simply a financial burden the paper could no longer bear. Still, it was a staggering denouement to a storied career of a man who in many ways mirrored the players he’d covered. Hal’s dad, Harold McCoy, who worked in the BFGoodrich rubber plant, was like Pete Rose’s father—a semi-pro ballplayer who had his son throwing baseballs against the house by the age of 3. Eventually, Hal became a star player at Akron East High School and went to Kent State on a partial baseball scholarship. Since 1962, save for a brief stint at the Detroit Free Press, he has worked as a reporter in Dayton—first for The Journal Herald, and then the News. McCoy’s exit is not just another story of a fading medium. It signifies the end of a powerful voice that helped perpetuate loyalty to the Reds across a swath of the Midwest—a local voice that brought Major League Baseball a touch closer to home. Your local reporter talked to Joey Votto. Your guy or gal sat down with Jay Bruce to talk about hitting (or in his case, not hitting) the breaking ball. This year only one newspaper reporter—The Cincinnati Enquirer’s John Fay—and Mark Sheldon from mlb.com will cover the team on a consistent basis. And while there are some—particularly those who break news on Twitter—who contend that a variety of other sources have more than amply filled the hole left by the crumbling of traditional media, in truth there is no replacing what multiple writers all working the same beat can give to readers. A group of informed, authoritative voices competing to scoop one another simply means the reader gets better insight into the machinations of the team, rather than the current alternative: diminishing substance from established news sources on one end of the media spectrum and a tower of obstinate babble (sports blogs, Twitter feeds, talk radio) on the other. One might think that 2009 would rank as the worst season of McCoy’s life. Not so. That distinction belongs to 1989, to a spring that began with Reds manager Pete Rose telling McCoy that he’d be gone for a couple of days—the commissioner just wanted Pete’s advice on something—and that ended with Rose’s lifetime banishment from baseball. When asked to run the paper’s own investigation into Rose’s gambling, McCoy took it on while writing game stories and coming face-to-face with the Hit King on a daily basis. The scandal and McCoy’s coverage of it strained what had been a great friendship for nearly two decades. The strain lasted until a few years ago when McCoy says the two put aside their differences. Rose, in another classic instance of Pete-being-Pete, says there were no differences to straighten. That summer of our discontent was followed by the 1990 season, with the Nasty Boys and Jose Rijo and sweet Lou Piniella leading the team to an improbable wire-to-wire World Championship. McCoy covered that ride from beginning to end. Should the team pull itself together and repeat the miracle, he won’t be there—not as he should. It wasn’t supposed to end like this. Like many of the athletes he covered, McCoy didn’t get what he wanted: two more years on the beat, perhaps, or the long shot chance to leave the Reds as he came to them—as winners. As a newly minted contributor to Fox Sports Ohio, he went to see the team play at its new spring training facility in Arizona. This new gig requires him to write three columns a week for the Fox Sports Ohio Web site, record podcasts, interact with fans online, and occasionally appear on TV. He’ll also continue to post entries on his blog for the News, while writing his Sunday column for the paper, “Ask Hal.” But he is now an existential free agent—a man whose livelihood has been taken from him—searching, hoping to stay part of the game. His game.